Pale lemon in colour, with perfumes of citrus and a touch of stone fruit. Rich yet fresh with a lime zest character running through the richness, which comes from the Greco fruit. Basilicata is embedded between Calabria and Apulia, in the south of Italy. One does not stumble across this region accidentally but chooses to visit it in search of a new experience, plunging into places where silence, colors, scents and flavors remove the visitor from the frenzy and stress of modern life and offer unique sensations. The woods and forests that cover the mountains are dotted with small and charming villages, some even at an altitude of 1000 mt, where pure air, genuine flavors and the beauties of nature are combined with historical vestiges satisfying every curiosity. Beautiful — yet less traversed than other regions — is the area of the Monticchio Lakes, one of the most spectacular locations in Basilicata. Lake Grande and Lake Piccolo are two splendid stretches of water that fill the two craters of Mount Vulture, now extinct, and are surrounded by thick and lush vegetation. Even though it is a mainly internal region, Basilicata touches two seas: the Ionian and Tyrrhenian. The Ionic coast, with the two famous sea resorts of Metaponto and Policoro, offers wide beaches, either sandy or pebbly, and partially surrounded by pinewoods and rows of eucalyptus that give off a lovely scent. The Gulf of Policastro, on the Tyrrhenian side, has higher and more indented coasts, where steep promontories alternate with small beaches washed by a crystal-clear sea. 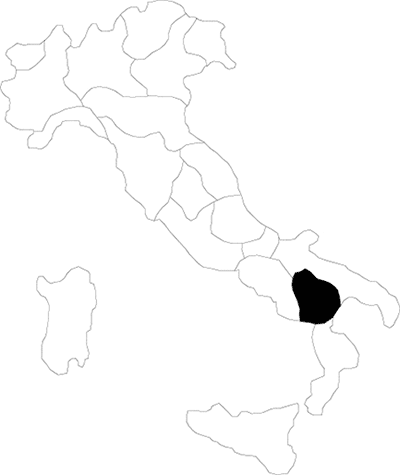 The provinces of the region are Potenza (regional capital) and Matera.